Another tax season has come and gone, and the same question is lingering in everyone’s mind – How will I spend my 2012 tax refund? Look no further, Shelving Inc. has the answers to all of your refund woes! In honor of another tax season ending, stop by our site on Monday, April 15th and receive an exclusive, one-day-only coupon for 10% off everything on Shelving.com. Instead of spending your money on useless ‘stuff’ this year, re-invest that extra money into home and business storage solutions from Shelving Inc. and get organized! Tax season is finally over, but the clutter from your last-minute tax preparations can often leave your desk or office looking unkempt. 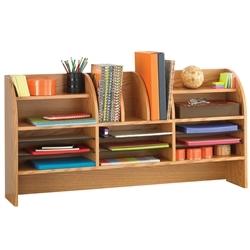 Clean it up with one of over 30 Desktop Organizers that Shelving.com offers. Available in light-weight mesh, laminated wood finish, or eco-friendly bamboo, these organizers come in a variety of sizes and colors to choose from. Best for keeping important documents safe and tucked-away, these storage trays are also a great way to stay organized and keep your important records within reach. Need more space for all of your records? File those worries away, because Shelving Inc.’s Chrome Wire Shelving Units are the perfect solution for organizing your documents. 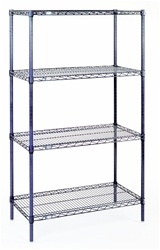 Made of industrial-grade welded wire, these shelves are strong, durable, and will support up to 800 lbs (evenly distributed). We offer unique sizing options for any space in your home or office, and add-on units can be attached in a few easy steps to increase your storage options. Available in classic chrome or powdercoat black finishes, these shelves make the perfect addition to any storage system in any room of the house. For all of the procrastinators out there, preparing your last-minute tax documents can be a real hassle, but storing them afterwards should never seem like a chore. We all know that Uncle Sam urges us to retain our old tax records for at least six years, but he never mentions where to put them all. 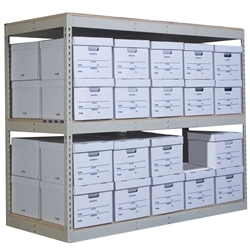 Clean up your tax records and file them away for safe-keeping on one of our strong, durable Record Storage Rivet Shelving Units. Made specifically to hold boxes of paper documents, these shelves offer a high weight capacity for heavy boxes and broad shelves to allow for added storage. Available with either wood decking or metal decking, Rivet Shelving Systems are designed and built to house all of your paper records with ease. Remember to stop back on Monday, April 15th for an extra 10% off all of our Record Rivet Shelving!